Anyone who is just starting out in sea fishing should not overlook the huge potential and many opportunities that estuary fishing presents. Often, especially for the beginner, fishing estuaries is more productive and less daunting than fishing in the open sea. By their nature, estuaries support very rich and diverse marine eco systems. The wide variety of marine creatures living in them, like worms, crabs, shrimps and fry, provide an abundant food supply for fish that visit them. 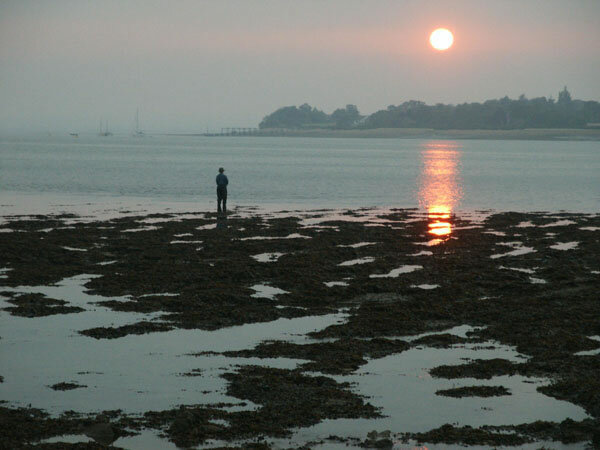 But perhaps the most attractive thing about estuary fishing is the number of different species of fish available and the variety of methods that can be used to catch them. 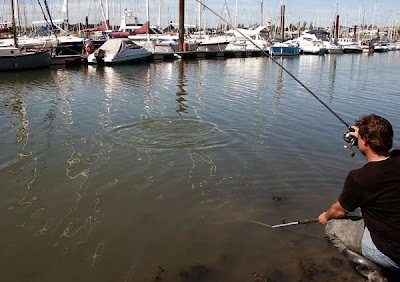 Here, we will look at the basics of estuary fishing, some of the fishing methods you can use and what you can expect to catch. The thing to remember when fishing an estuary is to use your eyes. There are many clues that will help you catch fish, if you know what to look for. If you arrive at the estuary when the tide is out, you will see many features that will attract fish when the water starts to flood over them. Sand bars and gullies will be uncovered, as well as shellfish beds and patches of weed and rough ground. You may see small channels, through which the tide will flood over mud flats, etc. These are all features that fish will explore, foraging for food, on the incoming tide. By putting your bait in the right place, rather than just casting randomly, you will be significantly increasing your chances of success. If you watch the tide flood, you will see even more clues, especially in the summer months. Mullet and Bass like foraging in shallow water and are often seen very close to the water’s edge in water that is barely deep enough to cover their backs. Watch these fish following the tide in and you will soon build up a picture of where they will be at any given state of the tide. Flocks of seagulls and terns dipping into the water are a good visual indication that there are feeding Bass in the area. Another thing to look out for, are channels in saltmarsh that drain into the main river as the tide ebbs. Saltmarsh provides an ideal habitat for many small marine creatures and many of them get swept away by the ebbing tide. The fish in the estuary know this and position themselves to take advantage of the easy meals being brought to them. Putting your bait in such places can be very productive. The most basic and popular method of fishing estuaries is legering, which is casting a lead weight to anchor a baited hook to the bottom. Because casting long distances is rarely necessary, you can use quite light tackle. A lot of tackle manufactures make specialist estuary rods, although they may sometimes be marketed as Bass rods, or ‘Flattie’ rods. They are, basically, just lightweight beachcasters of around 11ft in length and capable of casting 2 to 4 ounce lead weights and a decent size bait. A lot of coarse anglers use their carp rods for estuary fishing and they are often a good choice because of their versatility. Although you can use a light multiplier for estuary fishing, a good fixed spool reel is the ideal tool because, like the carp rod, it is very versatile and can be used for a variety of methods. Just make sure you get a good quality reel that has a good drag system and is resistant to salt water corrosion. It should be capable of holding a couple of hundred yards of 12lb to 15lb line. Because estuaries are full of weed, which drifts up and down the length of the river on the tide, you will need something to hold your rod up high to keep as much line out of the water as possible. You can use the old fashioned sand spike type rod rest, but a good beach tripod is a far better choice because you can use them on rocky and hard ground, such as sea walls, and they are lighter and easier to carry. Terminal tackle is best carried in small tackle boxes in a rucksack, as you will sometimes have to be quite mobile when fishing estuaries. The rucksack can be hung under the tripod to keep it out of the mud, etc. The species you can typically expect to catch whilst legering during the summer months are Bass, Eels and a variety of flatfish, although in some estuaries you can catch other species, such as dogfish and rays. During the winter, there can be some fantastic sport to be had with Flounders and the deeper stretches of some estuaries will often hold Whiting and Codling. 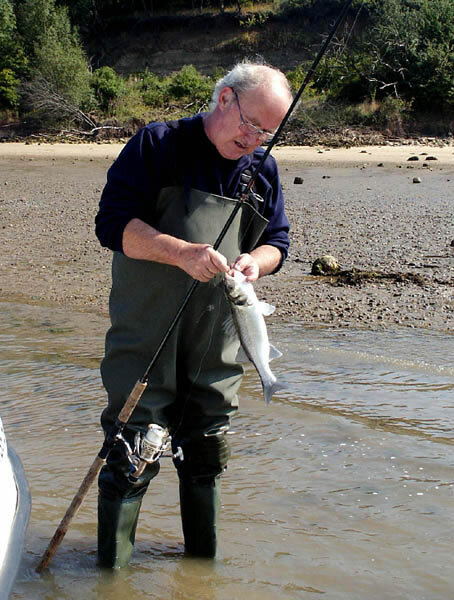 Of all the fish that can be found in estuaries, perhaps the most common is the Mullet. Almost every river in the country will hold Mullet from spring through to autumn. They are very easy to spot because they spend a lot of their time swimming just under the surface, but they can be notoriously difficult to catch! They rarely fall to heavy legering tactics and traditional sea baits. To be successful, the estuary angler has to approach them like they would a coarse fish. In fact, a lot of coarse anglers make the transition from fresh to salt water, initially, in pursuit of Mullet. This is because coarse tackle and tactics lend themselves perfectly to catching this hard fighting fish. By far, the most popular method is float fishing. A match rod of 12ft is ideal, matched with a fixed spool reel loaded with anything between 2lb and 6lb line. 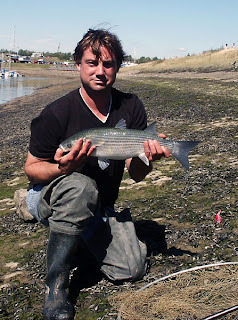 The lighter you can fish, the greater your chances of success, but Mullet can grow quite big and they fight very hard, so you can’t go too light or you will get smashed up. One of the best baits to use for Mullet is bread. Buy a couple of loaves of sliced bread, mash one up in a bucket with some water to use as ground bait and keep another one for hook bait and loose feed. Sometimes, the Mullet will only take tiny pieces of bread, so you have to match your hook size accordingly. It is not unusual to have to use a size 16 freshwater hook but whatever size they are, the hooks must be very sharp. This is because, contrary to popular belief, Mullet have very tough, rubbery lips. Perhaps the most popular species of fish found in estuaries, is the Bass. These powerful, sporting fish can be caught by a variety of methods, (including leger and float fishing), but the most exciting way to catch them is spinning. This is done by casting and retrieving a lure which mimics a wounded fish. Bass are ferocious predators and a large part of their diet is made up of small fish. When they are feeding, they will chase and attack anything that resembles a fish, including your lure! There are many different types of lure that are suitable for catching Bass, from plastic plugs and rubber eels to more traditional metals spoons and spinners. Some anglers spend a fortune on the latest ‘must have’ lures, but most of the time it is an unnecessary expense. Being in the right place, at the right time, is far more important than the type of lure you are using. If you find yourself in an area where bass are feeding on small baitfish, it won’t matter what lure you are using – if it moves, they will attack it! In fact, some of the cheapest lures on the market are also the most successful. The Toby and Krill type spoons, for example, are deadly. Again, using your eyes is the way to learn where and when to find feeding Bass. When they are feeding on baitfish, you will often see swirls or splashes on the surface. Diving birds also give clues as they pick off fish that have been driven up to the surface by marauding Bass. These feeding spells can last for as little as 10 or 15 minutes, so if you’re not in the right place, at exactly the right time, you will miss all the action. Thankfully, though, Bass are very much creatures of habit and once you learn where they will be feeding at certain stages of the tide, they become very predictable. As fishing different features at various stages of the tide will involve quite a bit of walking and you will be carrying or holding the rod for the whole session, a lightweight purpose built spinning rod is ideal. It needs to be around 9ft in length and capable of casting lures from as little as 5 grams, up to 40 grams. There are many on the market to choose from, including some excellent multi piece and telescopic travel rods. The best reel to use is a good quality fixed spool reel loaded with line no heavier than 10lb breaking strain. If you invest in a good reel with a couple of spare spools loaded with different breaking strain line, it could be used for all your estuary fishing, not just spinning. Hopefully, there is enough information here to motivate you to give it a go. Anglers who don’t bother with estuary fishing are missing out on some excellent sport. But apart from that, by fishing estuaries, you will learn a lot about fish, their feeding habits and tides that will stand you in good stead in any sea fishing situation. Tight lines!